Its Christmas Eve and there is only one sleep left before Christmas day, the excitement in the house is electrifying as most of the preparations are ready for the big day. So before bed time the last thing to remember is to leave a glass of wine and a mince pie for Santa and of course a carrot for Rudolf. Most people either love mince pies or hate them, unfortunately I am not a big fan of them although my family love them. However being vegetarian we find it hard to find vegetarian mince pies as a lot of shop bought pies use suet and often gelatin. I have always created a "cheats" mince pies for my family, sometimes its ok to cheat by buying ready made pastry and organic mince meat. These take less than 30 minutes to make and taste delicious. Delicious pastry with fruity mince meat. 1 tablespoon flour for rolling pastry out. 1 tablespoon milk for brushing pastry. 1. Preheat oven to 180 degrees C 2. Dust the worktop with some flour and roll out the short crust pastry to 3 mm thick. Using a cookie cutter in the shape of a flower cut out 12 flower shapes.3. Cut out 12 smaller flower shapes for lids.4. Line a muffin tin with the large flower shape pastry and make sure you push the pastry in the cavity to make a case shape.5. Fill the pastry cases with the mince meat and place the smaller flower shape on top to make a lid.6. 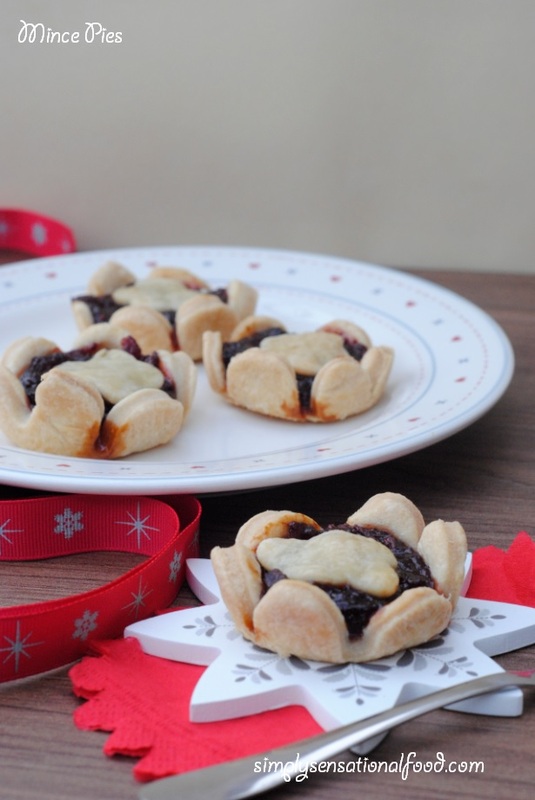 Brush the tops with a little milk and place the mince pies in the oven to bake for 15 minutes or until pastry is golden brown.7. Remove mince pies from the oven and allow them to cool slightly. Once cooled remove them from the tins and dust with icing sugar. I hope you enjoy these delicious mince pies, I am sure our Santa will as he always leaves a note asking us to leave him extras!!!! I would like to also wish all my readers a very Happy Christmas. Enjoy the festivities with family and friends. I had no idea that some mince pies were not suitable for vegetarians! Eye opening! I'm not a strict vegetarian but I do prefer not to have meat. Your mince pies look absolutely delicious. I'm not a huge mince pie fan but I think I'd actually eat yours! These look so pretty. I love mince pies and this sounds like a good recipe. 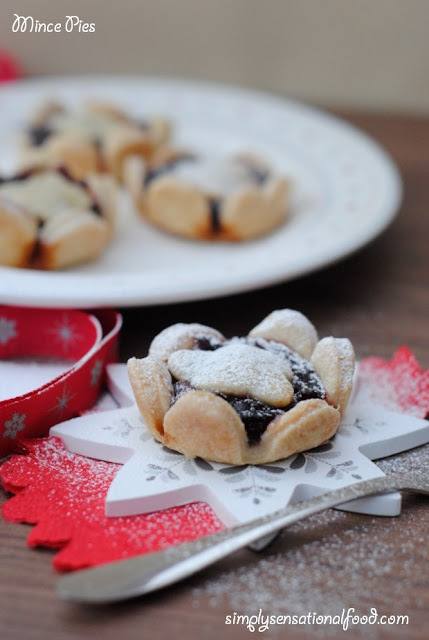 These look lovely I'm vegetarian but not a massive mince pie fan though may try these! I never realised that mince pies were not vegetarian. Recipe looks yummy! I always find it hard to find a good vegetarian mince pie, I will definitely try this recipe this Christmas (only 10 months to go, lol). Your mince pies look amazing. Like you we don't tend to but mince pies as often the ingredients may have something non vegetarian.